Place the saffron threads in a small mixing bowl along with the boiling water. Mix and let soak for 10 to 15 minutes. Heat the oil in a large and thick casserole over medium-high heat. Season the chicken with 1/2 teaspoon salt and pepper to taste. Once the oil is hot, brown the chicken for 3 to 4 minutes per side. Remove and place in a bowl. Add a couple more tablespoons of oil to the casserole and scrape drippings, don’t remove them though. Add the uncooked rice and sauté for 2 to 3 minutes, until its color starts to change to milky white and the grains separate. Incorporate the onion, green and red bell peppers, tomato and garlic and stir. Add the cumin, cinnamon, crushed cloves, 1/2 teaspoon salt and continue to cook for 4 to 5 more minutes, until vegetables have softened. Pour in the beer, and let it cook and reduce until it is almost absorbed and the alcohol has evaporated, a couple minutes. Place the chicken pieces on top of the rice, pour the chicken broth on top and the saffron and its liquid, as well as the remaining 1/2 teaspoon salt, and stir. When liquid starts to boil, add the peas and cover the pot, reduce heat to low, and continue cooking for about 20 more minutes, or until the rice is cooked through and the liquid has been mostly absorbed. If the rice grains don’t seem soft and cooked through, add a bit more chicken stock or water and let it cook for another 5 minutes or so. Turn heat off, and let it sit covered for 5 to 10 minutes. Fluff with a fork and serve. I am making this recipe for dinner tonight! Only problem is I don’t have saffron. Can I make it without it? Go for it, Samantha! Some other people in the comments also made it without saffron and enjoyed it…so I hope you love it too. Awesome recipe! Like the one in the cook book with chorizo! That’s my husband favorite and he doesn’t chicken and rice but loves this recipe. We substitute chicken broth for the beer since we are non drinkers. Oh I hope you have lots of fun in the kitchen, Carrie! So good lmuy RICO GRACIAS YO LO anconpañe con una crema quancaina de Peru!! I LOVE your show and you! You are so loveable and your recipes seem amazing! I’m gonna attempt your Aroz borracho con pollo as it looks fantastic! You cook with a lot of love and your family is blessed to have you! Enjoy the rice, Barry! And thank you so much. Well…I made your aroz borracho con pollo. My wife was not interested…until the smell floated from my kitchen! (She had 2 1/2 helpings and wants a repeat performance!) thank you for such an amazing meal! Uy mil gracias Daniela por ver el marathon y por dejarme entrar a tu casa! Dile hola a tus hijos de mi larte. My best friend is from Toluca and she always talks about growing up in mexico. So I ordere both of your cookbooks so I can suprise her and her husband with some of your delicious food. Can’t wait till the books come. Love you and your show. Oh what a thoughtful gift, Terri! I hope your friend loves her books. This was delicious, I wanted all of the things from this episode, made it in a caldero and it was fantastic. Can’t wait to try this dish! Have been watching your marathon on PBS, and I’ve fallen in love with all your recipes and your approachable way of creating authentic Mexican cuisine! Aww thank you so much, Barrie!! Drunken Rice with Chicken: delicious ingredients. However, the dish seemed bland and mild in taste. Could another flavor be added to this dish? I do love many of the recipes on the marathon especially the fish tacos. Hard to get really fresh fish in the midwest but worth a try anyway. Oh I’m sorry to hear that. You can add whichever spices your prefer…or some chiles. I hope you love the fish tacos, Harriet! Remember that much authentic Mexican food is not bold in flavor–much of American thinking about Mexican food is influenced by Tex-Mex (which is big, bold and yum, for sure, but not, for the most part, authenitc from the land itself). Can this be made ahead of time and reheated? Or will the rice become mushy? Sure! To reheat, put it in a sauce pan covered with a bit of water over low heat. You can also reheat it covered in the oven. Aww thank you Erin! Say hi to your kids for me. Saw this earlier today on PBS, made for dinner tonight. It was AMAZING! I love how Pati talks about her family and cooking for them on every show. She cooks with love and it is only proven when recipes come out perfect (even when I’m not that great a cook). I need to go buy your books! Oh thank you so much, Adam! I hope you have lots more fun making many more recipes. I’m not really a beer drinker and wouldn’t even know what kind to buy. Is it OK to replace the beer with white wine? I always have that in the house. 😉 If not, is chicken broth the next best option? Sure! You can also substitute the beer for beef, chicken, or veggie stock…or even water. I’m so glad you enjoy the show, Maryam! I hope you and your two kids have many fun kitchen adventures! So happy to hear this, Alberta! I made this recipe last week, but left out the beer because I forgot to pick it up from the store. It turned out wonderful, even without the beer. The flavors actually reminded me of a middle eastern flavor dish. It was probably the Cinnamon and cloves (I only used a pinch though). 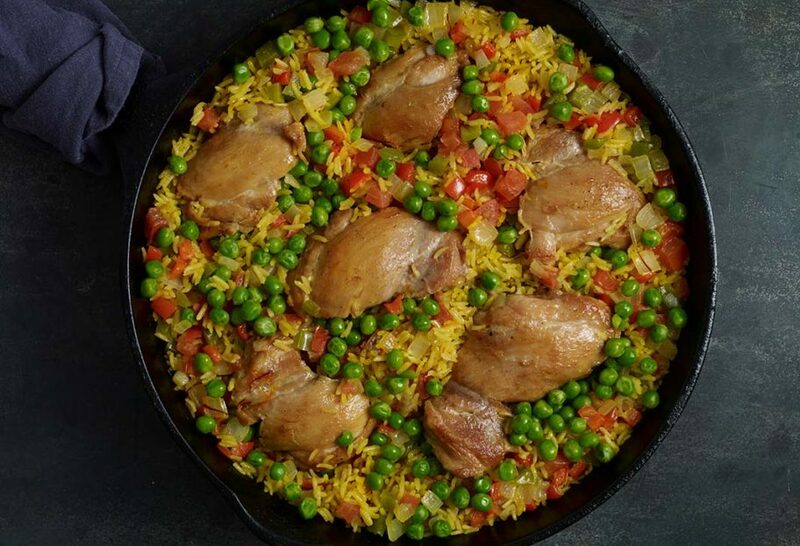 Patti, what is the difference between this dish and an Arroz con Pollo recipe? Do you have any other variations I can try? My kids and I love your show! Thank you for letting me into your home through my show and recipes! Can I make this without the chicken? Your recipes are wonderful! Thanks Pati! Of course! You can sub veggie broth for the chicken stock. This was delicious! I hate beer and thought of using white wine instead, but decided to stick with the beer. Glad I did- did not really taste the beer flavor but it did add a depth of flavor to the dish. Also, I did not have saffron and don’t care for the flavor, so used 1/4 tsp turmeric for color. Used a good 1/2 tsp cumin instead of a pinch and added about 3/4 – 1 tsp paprika for addtl flavor and color. Also, added black pepper and red pepper flakes since we like it spicy! I only had red bell pepper, so used 1 whole red bell pepper. Next time will use with green bell pepper per the recipe for addtl color. Also, had 1/2 a whole large onion left over from another meal, so chopped it all up- was probably a full cup. The recipe survived all my changes and was great, so it is pretty full-proof. Next time, I will use a little less liquid and maybe add some more peas. My husband loved it too and did not mind sacrificing some of his fancy craft beer! Thank you Pati for fully testing all of your recipes. I have only made a few of your recipes, but every one of them I have tried have been exceptional and “keepers”. So happy to hear they have all been “keepers” Catalina! Pati, using brown rice: should I cut rice to 1 1/2 cups or add 1 cup liquid ? Does 40 – 45 minutes sound right ? Would 300* be about right in the oven , because I burn everything I leave on the stove. Thanks so much. When my husband buys chicken he buys it in bulk, huge chicken and thighs connected. What can i do different since the chicken is so huge. And this chicken has bone and skin on, plz help cuz i would love to make it. What would be a good side dish served with this? i tried this yesterday for our sunday lunch, everyone loved it!. thanks. I’m thrilled it was a hit! Thank you for trying it! CAN’T WAIT TO MAKE THE RICE DISH MY KIDS WILL LOVE IT. I always know a good teacher when I can watch them make something and then go into the kitchen and do it myself. It’s so much fun to watch you cook the food you love with you family. I have a question about saffron; it’s expensive and I don’t use it often. How long can you keep it? Does it become rancid like other seasonings? Thank you so much for such a kind note! Saffron can last up to a couple of years if stored airtight in a cool, dark place. It’s in the send to last paragraph. I’m just so impressed that you answer all these comments – You’re a super rock star! Pati, I bought a brand new 12″ enamel cast iron braiser to make your Drunken chicken and rice. I was so excited but got disappointed because I was thinking the enamel pan wouldn’t have food stick so bad, my chicken did, I wonder what I did wrong. Then when I covered and put on low for 20 min. rice wasn’t done, help! Hi Grace! In my experience, sometimes food will stick when the oil isn’t hot enough. Make sure the oil is rippling in the pan before you put the chicken in. Also, if the rice isn’t done after 20 minutes, leave it cooking for a few more minutes until done. I hope this helps and that you will try the recipe again! Pati, Can I just substitute ground cloves instead of crushing them? If so, how much should I use? I always enjoy your programs & have learned a lot about your culture and food!! Occasionly I get brave enough to try something. This dish sounds DELICIOUS !! Thanks again for all that you do! Hi Gail, Yes, of course you can sub ground cloves. I would just add a tiny pinch. I’m happy you are going to give my recipe a try! You mentioned that you soaked the rice first in warm water before cooking it in the pan. How long do you soak it. I enjoy watching your show. Thank you. I do when I have the time! 5 to 10 minutes is all it really needs. Remember to drain very well. Thanks for tuning in! I just watched you make this last night on KLRU-Q. I LOVE your show. Concerning the pan used, is it a 12″ enamaled cast-iron braiser? Hi! When you first cook it in the pan, you want it to go to a bright white color and a heavier feel, it will take like 4 to 5 minutes. Hi Pati! I’m originally from Leon GTO. We watch your show faithfully! We record it so we can rewind and watch as many times as we need to get the process of each recipe right. We doubled this particular recipe so we have enough left over to take to work tomorrow for lunch and make everyone else jealous. The flavors are amazing! Thanks Pati for your cooking inspiration! This is such a wonderful idea!!! I love making double and triple batches as we are such fans of leftovers. Something that is not too dark or bitter, but quite frankly, any will do. I saw this recipe on TV last Saturday and I had to give it a try! Made this without the beer (used an extra cup if broth instead) and without saffron. Might have been good, but I had to run out for a bit right after it finished cooking, so I turned the heat off and left it sitting covered for a couple of hours, which made the rice overcooked. Also had to add a lot more salt because I used low sodium broth. Would love to try it properly made! oh no! Give it a try as I make it, tell me how it goes! I want to try this recipe but I do have a question. I know the recipe is called Drunken Rice With Chicken but can I leave out the beer? I don’t drink or cook with alcohol and neither do most of my friends. I know there is a non alcohol beer can this be used instead or should I just use more chicken stock? The reason I am asking this is because I read recently that the alcohol does not all leave the dish. Thanks for any help you can give me. Love your show! Hi Marianne, of course you can skip the beer! Just add same amount of chicken or veggie broth of your choice instead. Boneless legs are not available here, do you suggest we do the boning? Hi Nancy, Yes, you can debone the legs. I want to make this and have never had a chicken and rice recipe of any kind; however, while I’m a carnivore, my husband is a vegetarian. How will this recipe work without the chicken? Seems to me it would still be good, right? It will be fabulous, no worries, just skip the chicken! You can add more vegetables if you want as well. Amazing!!! The smell while it was cooking was heavenly. This recipe is delicious! I never leave comments on anything, but felt compelled to do so. My husband loved it. I could not find saffron and I used a whole chicken that I cut up, but other than that I followed it exactly. Love your show. Well I am SO very happy you left comments in here and let me know that you made it and liked it, Norma! Gracias! Awesome! We love your recipes brings our cultura and gives us new variety and ideas. My 6 year old with down syndrome is picky. She gets so excited and cumbias around when shows music starts. This recipe shes asked for. Could we substitute other cuts of chicken thats boneless n skinless also? Of course, you can use any chicken pieces, sometimes I even make it with chicken on the bone. I hope you and your 6 year old enjoy! I am wondering whwn you add the saffron and it’s liquid? I don’t see that step listed in the instructions. Thanks! Hi! You add it right when you add the chicken broth. Enjoy!